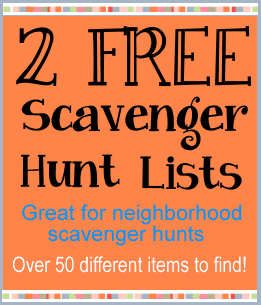 Each list has 25 items to find in a neighborhood scavenger hunt. Use the same list for each group or use separate lists so that they bring back different items. Rules and directions for scavenger hunts - See how to set up a scavenger hunt, score a scavenger hunt, how to play and break into teams along with tips to make it fun for everyone. More fun Scavenger Hunts and Treasure hunts for parties.